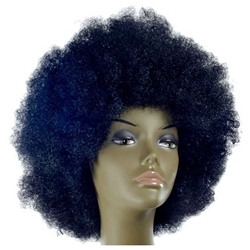 Our Deluxe Afro Wig is made of high quality synthetic fibers for the most realistic look. The Deluxe Afro Wig is available in Black or Brown. The wig features an elastic band on the inside for comfortable one size fits most sizing. Have a disco party to attend? What about a 70's themed bash? Then the Deluxe Afro Wig is the wig for you!